We’re coming to you live from my living room, where days have been taken off from work, and the big-screen is flickering to life. Of course, we missed the beginning of today’s action, due to my four-month-old son’s need to eat and have his diaper changed. He just doesn’t get it. Anyway, while the RTC crew has things covered from the various arenas, I’ll take you through the best two days in sports in the same way as 99% of America: from the couch. We apologize in advance for the baby vomit smell or if the crying drowns out Verne Lundquist. The plan is to focus less on Xs and Os, and more on the broadcast, announcers, commercials and coaches’ hairpieces. You know, the important stuff. If this works out, we’ll be back for a look at the night session later this evening. And yes, I know I’m not Bill Simmons. I make way more money than him, anyway. 1:28 p.m.: We’re early in the second half of Murray State-Colorado State. I’ve been watching for a while, but had my hands tied with baby bottles and burp rags. 1:30: Love starting with Lundquist and Raftery. To be honest, I don’t have a problem with nearly any of the CBS announcing crews. But I mean come on, who doesn’t love Raftery. They both do a good job making it seem like they knew ANYTHING about either of these teams before yesterday. 1:31: Am I the only one who is bothered by these generic black/natural courts the NCAA insists on installing now at every site? There was something cool about immediately knowing which site you were watching. Every time they show “The Shot”, I take pride in recognizing the Spectrum floor. I could tell you instantly that Tyus Edney’s memorable dash was in Boise, because of the garish floor they had there. This just seems so sterile. It’s … it’s so … NCAA. 1:40: Colorado State can shoot threes, but I feel like this is going to just slowly drift away from them. Murray State should not have been a 6 seed anyway. 1:41: We now have a third game in progress, with Louisville/Davidson going on TBS. The last hour has been like watching a single game. Now is when it gets really fun. #1 Syracuse’s Unbeaten Season Ends at Notre Dame. This is why projecting unbeaten seasons from power conference teams is an exercise in folly — in the modern game, there are always going to be at least a couple of off nights, and a motivated jacked-up home team will eventually take advantage. Notre Dame, no stranger to beating top-ranked foes in South Bend (seven times now), was ready from tonight’s tip and capitalized on a lethargic offensive night from the Orange to earn its biggest win in years. Some might point to the loss of Orange center Fab Melo to academics as the reason for Syracuse’s loss, but the truth is that the one factor that has worried us about SU all season — who will step up? — came back to bite them tonight. Dion Waiters is their best offensive talent, but he was 4-14 from the field; the next best talent is Kris Joseph (4-12), followed by the guards of Brandon Triche (2-6) and Scoop Jardine (0-5) — with around seven minutes remaining, Syracuse was still down 10 points but Notre Dame was teetering a bit. The game was there for the Orange to take if someone, anyone, had been able to put a series of offensive moves together. Nobody in orange could do so, and thus, the bedlam below. Jim Boeheim’s best teams in the NCAA Tournament always had a go-to guy, from Sherman Douglas to Derrick Coleman to John Wallace to Carmelo Anthony… who is it on this team? Duke’s Home Court Winning Streak Ends at 45 Games. We have no idea what fountain of offense Florida State discovered down there in the wilds of the Sunshine State, but the last three games for the Seminoles have been extraordinary. It wasn’t as much the 76 points that FSU scored in Cameron Indoor Stadium to end the Blue Devils’ 45-game home court winning streak, but it was the efficiency in which they did so. When was the last time a team shot nearly 15% better from the floor than Duke did in its own building? FSU hit 54% from the field on its way to another highly impressive 1.126 points per possession, its third straight game well over the Seminoles’ season average of 0.995 PPP, and the final play to hit Michael Snaer with a wide-open three on the right wing was outstanding in its execution. With a dominant home win over UNC last weekend and a road win at Duke to get to 4-1 in the ACC, could Florida State with its newfound offensive capability be the best team in the league? Hard to believe, but an authentic case can be made for Leonard Hamilton’s team right now. It may have felt like #1 Kentucky’s big win over #4 North Carolina was the only game of the day, but another 200+ teams who suited up today might beg to differ. Our thoughts on the earlier Game of the Century are located here, but this post will deal with the rest of the afternoon’s key games. Marquette Wins Badger State Battle. The second-biggest game on today’s slate was a rivalry game in the Badger State. Marquette wasn’t feeling very Badgerly today, though, as Buzz Williams’ team made a statement of superiority in taking down Wisconsin in Madison. You know, at the Kohl Center, also known as the building where Wisconsin never loses (12 times under Bo Ryan coming into today). MU exploited its better quickness and play-making ability to regularly break into the gut of the Badger defense and gang-rebound the basketball, and despite a good second-half comeback from Wisconsin, Marquette remains unbeaten and served notice to the rest of the Big East that, once again, the small school on the frontier of the conference will be heard from. With a home-heavy schedule the rest of December and a neutral game against Washington next week at the Jimmy V Classic, the Golden Eagles have a great chance at hitting 2012 at 13-0. As for Wisconsin, Jordan Taylor suffered a poor game (4-10 FG, one assist, five TOs) write the Badgers out of your top ten at your own peril. These are just one-on-one moves by a player good enough to not only create his own space, but also to knock down the long jumpers. XU had a horrendous first half (18 TOs), but was able to claw back into the game by taking better care of the ball and tightening up its defense. The key, though, is Holloway. He’s such a difference-maker with the ball in his hands that you have to believe that Xavier will win just about every close finish they’re involved in this year. Big East Dominance. The SEC/Big East Challenge hasn’t formally ended yet, but as of this writing, the Big East had run out to an 8-2 lead with the two remaining games happening later today. After Friday night’s 4-0 Big East record, the SEC had virtually no chance to tie, but Connecticut ensured the victory in a convincing win over Arkansas, while Pittsburgh outlasted Tennessee in Knoxville. Right now, we’d peg the SEC as a four-team NCAA league with a reasonable shot at a fifth, while the Big East looks like a surefire eight-team NCAA conference with a reasonable shot for a ninth and an outside shot at a tenth. Butler Not Butler. Nobody expected Butler to immediately recover from its personnel losses after last season’s run to the national championship game, but Brad Stevens’ team is really struggling after an overtime home loss to Valparaiso today. Through eight games, the Bulldogs’ best win came against Savannah State, and a murderer’s row awaits in the next few weeks — Purdue, Xavier, Gonzaga, Stanford. We have learned our lesson about writing off Stevens teams, but right now it wouldn’t surprise us in the least if BU enters the meat of the Horizon League schedule with an overall losing record. The Bulldogs are having trouble shooting the ball from both the line ( 61% on the season, 17-29 today) and behind the arc (29% on the season, 6-20 today), two key components of their attack — until Stevens shores up those areas, Butler will be just another mid-major team. What a game. It was the most highly-anticipated regular season game of the college basketball season with good reason. The likelihood that both of Kentucky and North Carolina will be playing deep into next March/April is better than not, and although we find the “look how many NBA players there are on the court” mantra somewhat tiresome, there’s no denying that elite talent was peppered all over the Rupp Arena floor this afternoon. Let’s take a look at some of our thoughts and observations from today’s early Christmas present to hoops fans around the nation. CBB Atmosphere At Its Best. It’s really, really hard to completely silence Rupp Arena, yet at a couple of points in the first half — notably when Kendall Marshall and James McAdoo dropped threes to give UNC an eight-point lead twice, you could hear the coaches yelling at their players on the sidelines, sneakers squeaking, and the ball bouncing off the floor. That’s no easy task in a building that holds over 24,000 people. But as Kentucky mounted its inevitable comeback in the second half, the old barn roared to life. When Marquis Teague’s layup a few minutes into the second half finally gave UK its first lead since the opening minute, the energy coming from the place could have fueled all the power needs for the city of Lexington for the next several days. It never relented the rest of the afternoon. Given the overall atmosphere of Rupp, the high quality nature of the play, and the regal names on the front and back of the jerseys, today was a special day that captures what college hoops is all about when it’s at its best. Kidd-Gilchrist Was the Star of Stars. Anthony Davis may get all the attention (including from his coach, who has declared Davis as the definite #1 pick in next year’s draft) and he may have been the less heralded player in his matchup against preseason 1st team All-American Harrison Barnes, but Michael Kidd-Gilchrist was the best player on the court today. It is easy to forget that he was the top recruit in his class until his senior year when some recruiting services moved Davis and/or Austin Rivers ahead of him. Kidd-Gilchrist may not have that one skill that makes NBA scouts jump out of their seat, but he does a lot of things well and you would have a tough time convincing us that there were many players in the nation tougher than him after the show he put on today. While Terrence Jones kept the Wildcats alive early, he did not score another point after hitting three free throws with 4:27 left in the first half. After that, it was Kidd-Gilchrist leading the way as he scored 14 of his game-high 17 points when Kentucky most needed it. Davis and Jones may get most of the headlines for the Wildcats, but today showed that opposing teams would be wise to game plan for Kidd-Gilchrist too. Anthony Davis Is a Work In Progress. After the game everybody wanted to talk about the late block by Davis on John Henson’s final jump shot. While it was an outstanding block and something that we would not have gotten to even if we were holding a broom, it is worth pointing out that Davis didn’t really play all that well today. For most of the first half he was abused by Tyler Zeller, who quickly realized that he had to make his move early on Davis before the precocious freshman could collect himself to rise for the block. Davis is unbelievably long and athletic with a ceiling that makes NBA scouts and fans drool, but he is nowhere close to a finished product right now. Davis probably will end up being the top pick in next year’s NBA Draft, but it isn’t because he is the best player or even the best freshman in the country. In fact, he may not be the best freshman on his own team. But as we discuss below breaking down the final play, he has tools that are simply beyond normalcy — it’s going to be simply a matter of harnessing them. Harrison Barnes Comes Up Small. We don’t want to come too hard on Barnes because we saw what he was capable of late last season, but today he was outplayed by Kidd-Gilchrist. Part of this was due to some early foul trouble (picking up a dumb third foul with 6:19 left in the first half when UNC was up by seven), but at times he seemed to drift a bit and he certainly was not as assertive as the Kentucky freshman. He is probably still a top 10 prospect, but we should stop expecting him to be a superstar every game until he proves that he can do it on a consistent basis. We should also probably re-evaluate where he is in the pecking order of college basketball stars and whether he is still the regular go-to guy that we thought he was last season or if UNC should spread the ball around a little more in late-game situations. He made a clutch three with just over three minutes remaining to keep Carolina alive, but he should be more than a long-range jump shooter (4-5 threes today, but only five FGs) given the overall skill set that he has developed. The Phenomenal Davis Block. John Henson is an awkward, unnatural jump shooter, and his catch wasn’t clean on a tipped pass to the spot he was standing with eight seconds remaining, but we’d wager that Anthony Davis’ swooping block coming from somewhere around Section 230 at Rupp Arena is the first time he’s ever been packed on a wide open jump shot when he left his feet. That’s how phenomenal that defensive play was. Davis was standing right in front of the basket when the ball hit Henson’s hands about twelve feet to the right side of the basket. Watch the replay closely. In less than a second with one step and a leap, Davis’ hand covered about 15 feet of space and met Henson at the top of his jump to swat the ball back into his hands to secure the victory. That play alone may have secured his selection as the #1 pick in next year’s NBA Draft. Not only did it save the game for Kentucky, it was the kind of play that makes scouts take notice — if you hadn’t seen it before, those Marcus Camby comparisons forced themselves out of the screen on that play. A Strange Ending. After the Davis block, it appeared that UNC just gave up on the game. There were at least five seconds remaining when he secured the ball after the tip, and even after finding Marquis Teague in the corner to dribble the clock out, the Carolina players only half-heartedly ran at him to commit a foul. Once a Tar Heel got to Teague with about a second left on the clock, he only provided a very light push to his back which was not (and should not have been) called. Roy Williams will without question use this as a teaching moment for his guys, because Kentucky had just missed the front end of a one-and-one prior to the Henson/Davis shot-block, and there would have been at least a second or more remaining had the Heels put UK back on the line. The other side of this is that for the second time in a little over a week, a player in live game action picked up the ball and started running with it prior to the clock expiring. Last week in Maui, Wesley Witherspoon did the same thing in a game against Tennessee, turning the ball back over to the Vols for a last shot attempt, and today’s culprit was Teague. He tucked the ball on his hip in the open court with just under a second and started running with it, thinking that the clock had run out. Luckily for the Wildcats, there was no whistle (the refs probably couldn’ t hear the horn), and the game ended just after that. Without question, both coaches will have a few teaching moments deriving from the last six seconds of what was otherwise a pretty entertaining game. It wasn’t the sexiest bracket you’ve ever seen in a Thanksgiving weekend tournament. There were no teams ranked in the top 25 prior to this weekend and no player of the year candidates to be found anywhere. But there were some great coaches, some solid teams expected to contend for their respective conference titles, and some good basketball played at the 76 Classic in Anaheim this weekend. By way of putting a bow on this tournament, let’s take a look at some of the highlights of the weekend. Champion: St. Louis – The Billikens take home the championship without ever being seriously challenged this weekend. They posted a 60.6 effective field goal percentage over the three games, nailing 29 threes, and as a team they posted almost a 2-to-1 assist-to-turnover ratio. 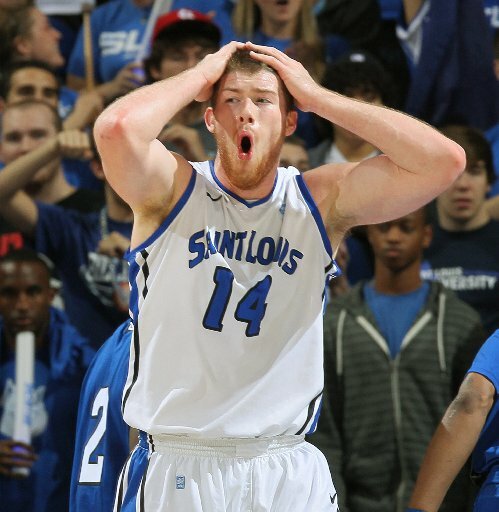 But where the Billikens really excelled was defensively. They limited their opponents to less than seven offensive rebounds per game, forced almost 15 turnovers per game, held their opponents to under 45% shooting from the field, and did all of that while only allowing their opponents 15 free throws per game. With Brian Conklin emerging as an efficient offensive threat, Kwamain Mitchell returning to the fold as a great floor general and playmaker for the team, and a deep and talented bench capable of carrying out head coach Rick Majerus’ game plan, this is a disciplined team that can give all sorts of teams trouble this season. Surprise Team: Santa Clara/Oklahoma – Both the Broncos and the Sooners came away from this weekend with a 2-1 record, and both teams come away with their share of converts. When Santa Clara senior forward Marc Trasolini went down with a torn ACL in September a lot of people counted out the Broncos. That injury left the Broncos with an inexperienced frontline to pair with its prolific backcourt of junior Kevin Foster (who broke Steve Nash’s all-time record for three-pointers at Santa Clara this weekend) and sophomore Evan Roquemore, but this weekend Kerry Keating’s team proved that those guards (along with junior wing Ray Cowels) were good enough to put this team on their back. Meanwhile, not much was expected of an Oklahoma team that went 14-18 last season. With more or less the same roster returning, similar results were expected, but under new head coach Lon Kruger and with new point guard Sam Grooms taking the reins, the Sooners advanced to the championship game before getting outclassed by the Billikens. While the Sooners should not be expected to contend for a Big 12 title, Kruger definitely has this program headed in the right direction, and this team will rise up and knock off some teams this year. 2011’s Kemba: Thomas Robinson, Kansas. Everyone who follows this game had an idea that Robinson was capable of putting together a monster junior season, but not many folks had seen it happen yet. After three games where he averaged 17/12 and shot 50% from the floor, most of America has now seen the leap. Improved NBA Stock: Jeronne Maymon, Tennessee. Before his Achilles injury on Wednesday, Maymon became the first player to record a 30/20 game in college basketball since Blake Griffin did so in 2009. As in, the overall #1 pick in the NBA Draft, and last year’s Rookie of the Year. El Busto: Josh Smith, UCLA. 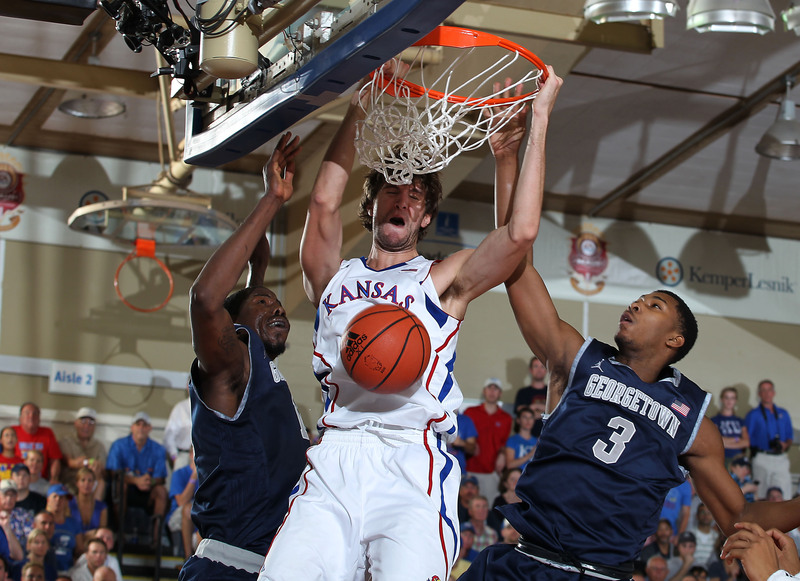 Looked and played like he was overweight all week — KU in particular made him look foolish (one point, five fouls). Consensus is that he has serious talent, but will waste his career unless he gets the pounds under control, stat. Serious Soul-Searching: Josh Pastner, Ben Howland (tie). Perhaps more was expected out of Memphis this year, but Howland’s team has no team chemistry and plays like a low-major. Pastner’s players are talented but often appear to have no clue how to properly run a set or play the game in a structured manner. Fan Award: Kansas. Said this before, but we didn’t think Kentucky fans last year could be outdone, but KU fans this year did just that. Best Cheerleaders: UCLA. Only one of two schools that brought them, along with Kansas, but let’s be honest here. Every team could have brought a traveling road show of dance teams, cheerleaders and yell squads, and it wouldn’t have mattered. This was the biggest mismatch in the entire Maui field this year. 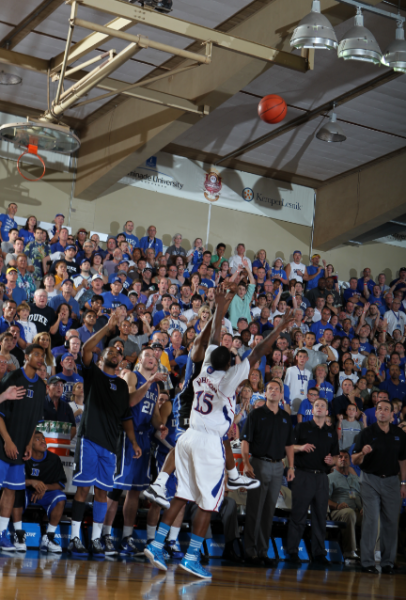 The environment in tonight’s Maui Invitational championship game was phenomenal. Duke and Kansas both had the strong support of fans passionately cheering for their teams, and it was a shame to see either one go home a loser after what was a great tournament. The ESPN-funded tournaments in Puerto Rico, Orlando and Anaheim this week are all are fine and well, but the organizers haven’t figured out that teams playing in front of crowds with more empty seats than filled ones loses much of what makes college basketball exciting and special. Sure, Maui is in a preferred situation in that it can engineer fabulous matchups like Kansas vs. Duke, but the tweets from around the country raving about the environment in Lahaina tonight suggest others should strive more to mimic what they have. Let’s jump into some musings on the Duke-Kansas championship game first, followed by the Michigan-UCLA third-place game. Tyshawn Taylor is such an enigmatic player. In the first half of tonight’s game, he was mostly spectacular, with 13 points and three assists to lead KU to a nice four-point lead over Duke. In the second half, he quite literally self-destructed, committing a ridiculous eight turnovers and only adding a single assist as Duke kept pushing forward. Think about it, in a game played in the 60s for both teams, that’s eight additional second half possessions that Taylor single-handedly gave to Duke. The most crushing error Taylor made was at just under a minute to go when he simply lost control of his dribble on a Ryan Kelly hedge with Kansas down two points. It wasn’t a disastrous turnover by itself, but it allowed Duke to gain the possession where Tyler Thornton received a pass under duress (arguably after a Seth Curry travel) and dropped in a closeout three from the corner. Kansas will once again win a lot of games this year, as they always do, but the knock on the Jayhawks coming in has been whether you can trust Taylor to get it done when the heat is on — tonight’s second half performance is highly suggestive that you cannot. 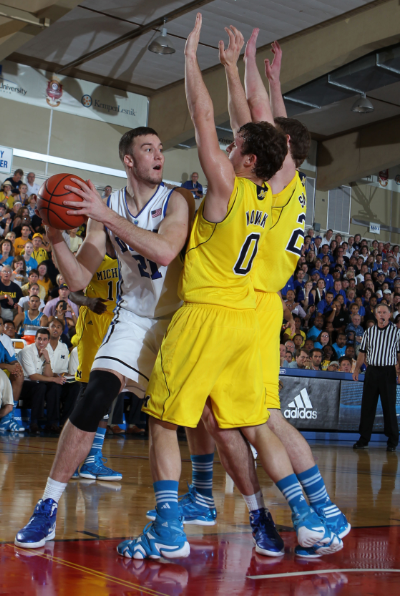 Moving back to that game-winner, what can you say about the onions on Tyler Thornton tonight? Not only did Mike Krzyzewski sub in the sophomore over his all-world freshman Austin Rivers at the end of the game, but a kid who had attempted a grand total of nine shots all season coming into tonight’s game made Coach K once again look like a genius by hitting not one, but two, contested threes from the corners. Krzyzewksi said that Thornton essentially won the game for Duke, and no doubt the image of his scissor-kick jumper will cause KU fans nightmares for years. 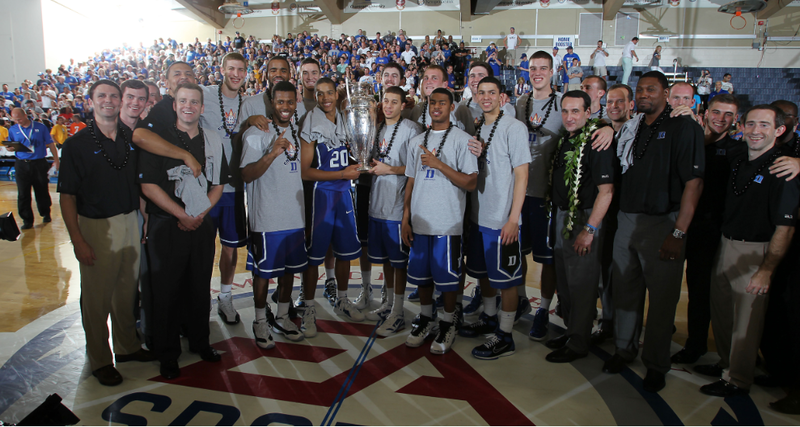 As Bill Self said in Tuesday’s press conference, Kansas came to Maui to play the Blue Devils. KU fans probably felt like they had a pretty good chance to knock off Duke, a team that has now beaten the Jayhawks in four of the schools’ last five matchups dating back nearly two decades. But Taylor’s erratic mishandling of the basketball in combination with Thornton’s confidence in his jumper resulted in yet another crushing blow against Coach K for the school from Lawrence. Coach K referenced this in his post-game comments, but it was crystal clear from the opening Michigan possession. Duke’s primary objective was to deny the ball to Tim Hardaway, Jr., in hopes of frustrating him and eventually causing him to force things. It worked. We watched closely as Duke’s Andre Dawkins, Austin Rivers and Tyler Thornton put on a clinic in denying THjr the ball during the first half — especially Thornton. His usage of angles and subtle but effective positioning was outstanding; when you watch a defensive performance like that against one of the better scorers in college basketball this season, you really begin to appreciate the coaching that Krzyzewski and its staff does with their players. Hardaway was 0-6 from the field in the first half and the few shots he got were clearly rushed. Really can’t say enough about Trey Burke for Michigan. As a freshman in just his fifth game of action, he was often Michigan’s best player on the floor today. He finished the game with 17/3/9 assts, but it was his shooting and set-up skills in the first half that kept UM from being completely blown out of the Lahaina Civic Center. With a superb backcourt in place to go along with a serviceable frontcourt and enough shooters to run John Beilein’s sets, the Wolverines are going to be just fine. Right now, we’d place them behind only Ohio State and Wisconsin in the Big Ten, ahead of Purdue, Michigan State, Northwestern and the rest. Call us a Beiliever, but we’re sold on this Michigan team. Twelve straight hours of hoops here in Maui can leave you a little loopy, but that’s the situation we’re facing here after 160 minutes of fairly entertaining basketball spaced out over half a day. 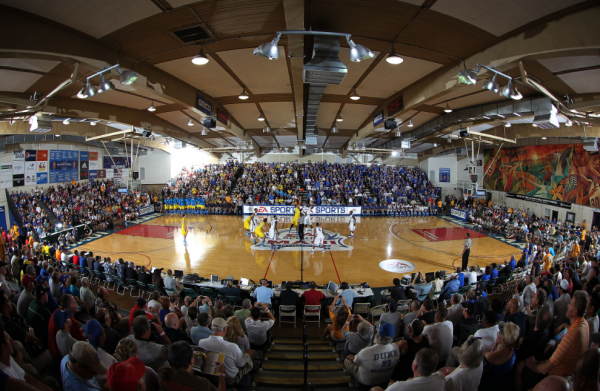 Ok, maybe it was 140 minutes of compelling stuff until UCLA woke up against Chaminade in the first evening game, but the point is that the quality of hoops being played this year in Maui is good for so early in the season. Here are some thoughts from the afternoon/evening games. For Act I on the morning/early afternoon games (Michigan-Memphis and Duke-Tennessee), click here. UCLA is a conundrum surrounded by a riddle wrapped in a question mark. There’s just no figuring this team out. It’s spurious to try to draw reasonable conclusions from a game against a D-II school, but in two halves we saw a team that couldn’t impose its will against a group half its size versus a team that looked talented enough to make it into the NCAA Tournament’s second weekend. Here’s what we do know — the Bruins’ company line in the aftermath of Reeves Nelson’s latest flub (oversleeping and missing the team bus to the airport, causing him to need to take a later flight) is that his addition to the game in the second half “brought energy” and helped UCLA go on a 29-3 run to blow the game wide open. So let’s talk about Nelson, shall we? The 6’9″ junior was forced to sit out the first half as a penalty for his transgression, but if you heard Ben Howland and his players talk about his contributions after the game, you’d have thought he went for 20/10 after the intermission. Instead, he took two shots (making neither), hit one of two free throws, grabbed five boards (all defensive), tallied a couple of assists, and got a steal and a block. For 11 minutes of action, it’s a nice hustle line — no doubt about it. But to hear Team Bruin tell it, they wouldn’t have won this game without his performance. While we love glue guys who put their all into every play, Nelson typically isn’t that guy and this situation sounded a bit too much like Intervention where everyone is afraid to tell the truth about someone for fear it’ll set him off. This UCLA team is definitely worth watching for the next few weeks, at least until the semester break. They say that Aloha means hello and goodbye here in the Hawaiian Islands, but after an entertaining morning/afternoon session of basketball, we’re still busy figuring out what to say during all the in-between periods. Regardless of our problems with language, and despite the breathtaking beauty of the landscape outside the gymnasium door, there is some equally compelling, if not gorgeous, basketball being played inside. Here are some of our thoughts from the afternoon session, BGTD-style, here at the Lahaina Civic Center. Michigan picked apart Memphis in a way that well-coached teams do to athletic, undisciplined teams. In some aspects of the game — most notably, running the offense and crashing the boards, Michigan made the more athletic Tigers look silly in their approach. John Beilein’s team hit over 50% of its shots by selectively deciding when to drive the ball and when to pull up, and it worked to near-perfection. The Memphis defense at this point all too often tries to rely on its athleticism rather than principles, and with the precision of clockwork, Michigan found back door opportunities repeatedly as a result. Tim Hardaway, Jr., was excellent in both picking his spots (6-13 FG, but 9-10 FT for 21 points), crashing the glass (seven rebounds) and looking for others (five assists). He has the ability to put up those kinds of numbers every night out — like his dad, he has the look of a star (“I got skeelz.”).